Whole animal cooking is trendy and all, popular like it was just discovered. But the truth is that it’s been done everywhere, all over the world, yes, especially in Mexico. Which brings me to beef tongue, one of the most beloved traditional dishes practically anywhere —well, except modern America. What’s going on? I mean, the stuff is incredibly delicious, inexpensive and easy to prepare. Wake up, America! Sadly, it might take a little legwork to procure a beef tongue — a Mexican market or local butcher is a good place to start. Some butchers offer cured smoked (fully cooked) tongue, which is what I’ve chosen for this preparation — (because it’ll be the easiest place for neophytes to start on their tongue journey). If that’s not available to you, slowly simmer a whole raw tongue in water in a slow cooker — add a sliced onion, a few cloves of garlic and some dried herbs — until tender, usually about 8 hours. Cleaning instructions are in the video. 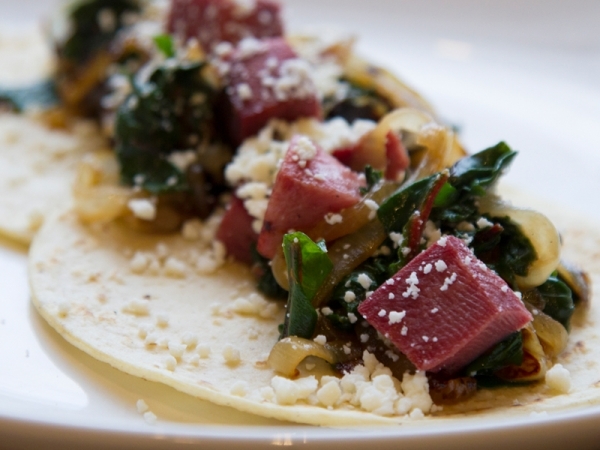 To balance all of this beefy, rich goodness, we’re coupling the tongue with leafy greens, garlic and caramelized onions. 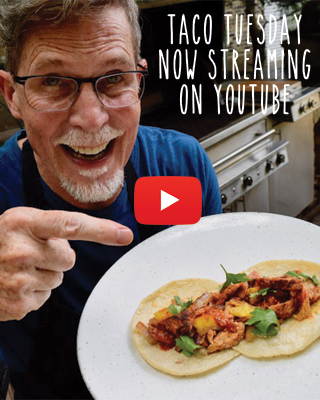 Fold it all into a warm tortilla and you have one of the more adventurous, and certainly most delicious, tacos in the #TacoTuesday repertoire. I think rather than simmering it with the skin on, as you do, I do a pre-cook, usually pressure steam it, then cool it enough to prep and peel off the skin. Then there’s lots of next step options to finish cooking. A fresh simmering broth now would have no contact with the original tongue surface and can be concentrated safely. I get excellent quality tongue here in Vermont, but I don’t like the idea that the living surface of the tongue (regardless of how well cleaned it is) is bathed in a broth that you would then use further. This is indeed a great meat, and a real bargain. I have tried smoking it, delicious but too dry so far. I grew up eating tongue cold cuts from the kosher deli’s in Cleveland. That’s a recipe I would like to learn!